Yes, it had to be a viking helmet. After thinking for an idea for the challenge, i came up with this helmet for my submission. I was partly inspired by the trailer for the Dreamworks animation film “How to train your dragon” and partly by the fact, that i wanted to fold a hat or helmet that had something stick out from it. 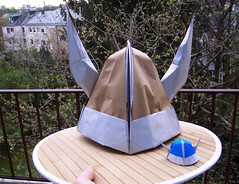 The smaller and easier version of the viking helmet is folded from a regular 15×15 cm square of origami paper. I made a video tutorial for the little viking helmet. Posted in Diagrams, OrigamiTagged "viking helmet diagram", cap, color-change, crown, design-challenge, hat, headgear origami, helmet, Keep Folding On, Mitanei, origami hats, viking, viking-helmetBookmark the permalink.